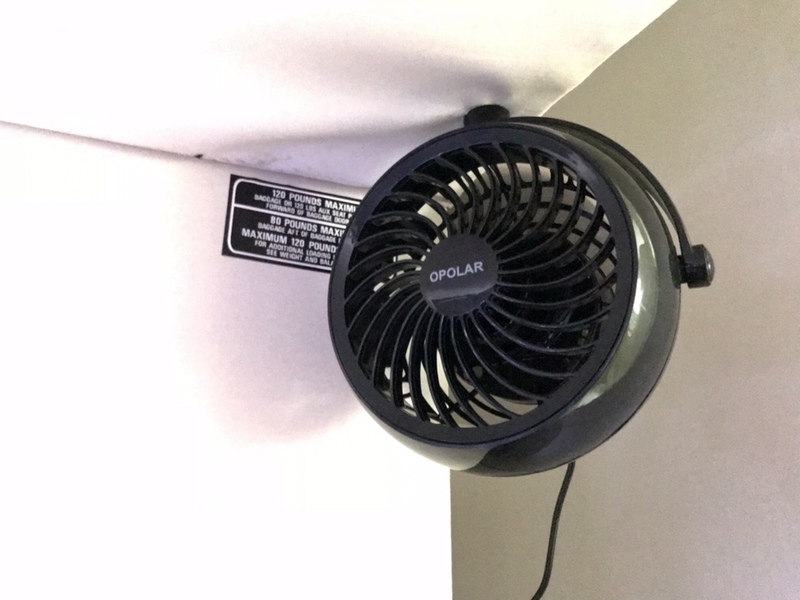 I purchased a few USB-powered fans when the hurricane blew through here a few months ago, and I have had one clipped to the back of my cockpit to help keep me cool when things warm up in the sim room. The clip always got in the way when I tried to move around to the right side of the cabin and access the PC, so this morning I figured I would take on a small project and mount it to the ceiling. I explored the idea of having the fans blow through the air vents at the front of the cabin, but it just wasn’t practical. I think my other solution turned out quite nice. 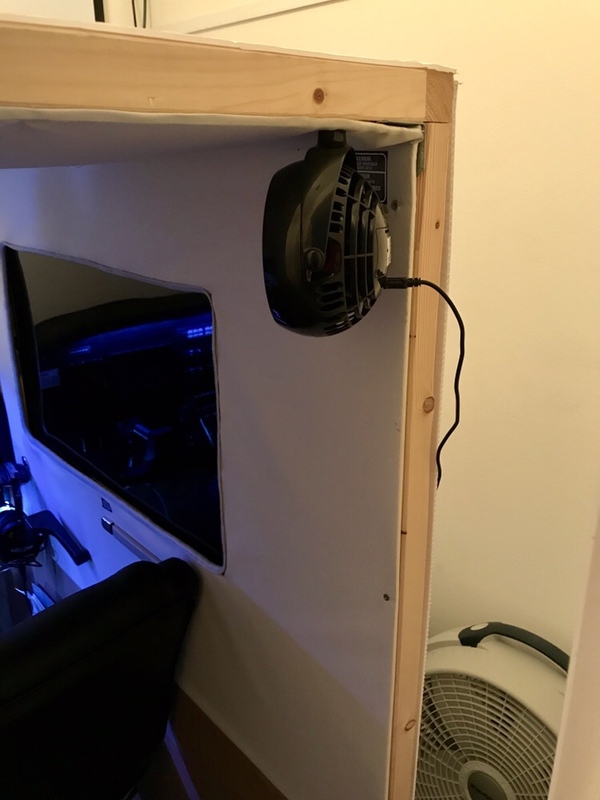 I used a USB-powered trio of fans in the ceiling of my cockpit, with a flush-mount white grill. These are made for A/V cabinets. They have variable speeds, are relatively quiet (the noise they do make sounds like a Cessna 172), and even come with temperature sensors for a small extra cost. The purpose is to draw heat up and out from my sim, rather than blow cool air into it. For that, I have a small AC powered fan lying on the floor across the room behind me, blowing cool air at the back of my feet. It creates a circulatory effect which works great. This is all due to the fact that my PC running X-Plane is -inside- my closet sim. Awesome sim and great work with that fan! can you make a video on mount fuji it will look good . That’s one of the reasons why I never went enclosed. Lack of ventilation or having it and go deaf. Like what you did with that closet Steve Williamson. Proposed it to my wife and got the “look”. I never had any issue with heat or noise in the basement. The closet (8×10) would be no problem if I wasn’t running a projector. The fan comes on when I close the pocket door. That said, a front flat screen is probably in my future. In my closet sim, it only sticks out into the room 30″, so the footprint impact it has on the room is just 30″ deep by 60″ wide. If I had a shallower desk to begin with, the whole thing could be even further into the closet. BFG, as you mentioned, a projector wouldn’t work with a closet sim. A flat panel would be required for the front view. 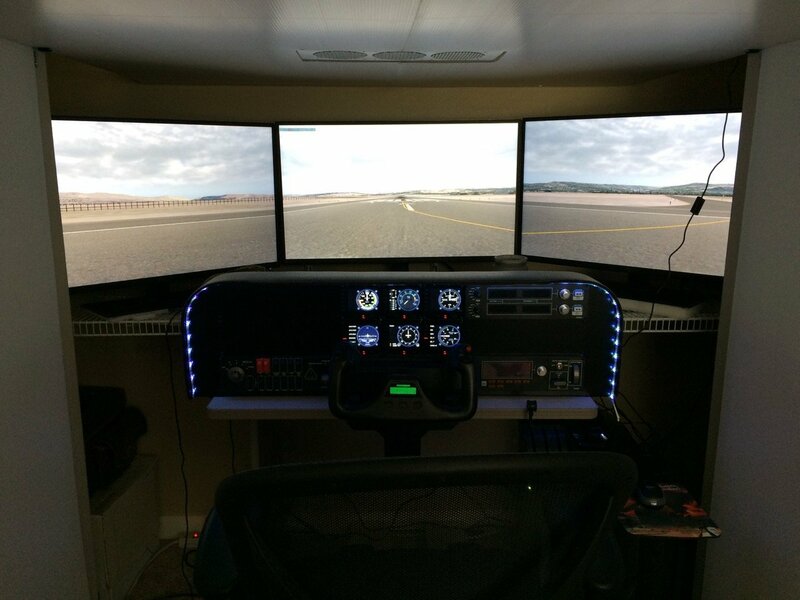 I am considering switching to a large flat panel immediately on the other side of the cockpit panel and moving two of my 32″ monitors to the sides, mimicking the cockpit side windows as you’ve done. Stay tuned.